There are footprints all over Walt Disney World, and when you consider how much the average guest walks in just one day at the theme parks (the range falls from 5 miles a day to 10+ miles a day), it’s no wonder. I often talked about the sidewalks of Walt Disney World, and how impeccably they merge with the theme of their surroundings, but today I want to talk about the details that have been added to these pathways by “previous” guests. Stepping back a little ways, foot power was the first mode of transportation highlighted as you wound your way up and into EPCOT Center’s World of Motion. Footprints ran along the wall and ceiling, leading guests to cavemen who are attempted to cool their hot hooves, much as I imagine these guests will be at the end of the day. Across Future World, and a couple of years, we are now met by Figment’s feet, both while on Journey Into Imagination with Figment and as we make our way towards the Kodak “What If” Labs. Again these prints make their way along the wall, though this is much more believable from a Figment of Imagination rather than prehistoric man. Over in Disney’s Animal Kingdom tracks can be found in almost every corner of the park. This does not come as much of a surprise given that animals are the focus of the guests’ attention, and every intention is made to show these animals as free roaming. Yet, some of the most intriguing prints in the park come not from live animals in the park, but from the extinct and mythical creatures that inhabit the corner of Asia and Dinoland U.S.A. Before even entering Expedition Everest, younger guests are met with their first challenge, meeting the height requirement set by one yeti footprint. Once inside, however, molds of yeti tracks that have been found in the Himalayas greet guests and set the stage for what is sure to be the expedition of a lifetime. While over in front of Dinosaur, Sue has been making tracks as she makes her way towards the Dino Institute. Dinosaur prints are not found only in Disney’s Animal Kingdom, however, Disney’s Hollywood Studios also gets in on the act, as along the shores of Echo Lake Gertie has also been making tracks and cracks. Like with the other parks, Gertie does not walk alone. Just down the path stands Star Tours enormous AT-AT Walker (All Terrain Armored Transport) who not only stands tall as an iconic image of Disney’s Hollywood Studios, but also has made quite an impression. Thankfully, I have been able to verify that no Rebels were harmed in the making of this footprint. The Magic Kingdom is home to my favorite track. 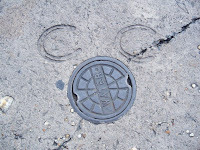 The Main Street Gazette featured this print once before, but the mysterious hoof prints found outside Liberty Square’s Haunted Mansion are not only a fantastic detail they also form one of the greatest Hidden Mickeys found in the parks, that they are definitely worth scaring up to talk about again. As well, inside the walls of the Haunted Mansion, 2007 sprucing up of the manor included a look at some other ghostly footfalls never before seen by living eyes, and added a true ‘wow’ moment to an already exceptional attraction. Footsteps, left by a variety of creatures, both real and imaginary, fill the walkways and byways of Walt Disney World, but they are not only limited to the confines of Orlando. 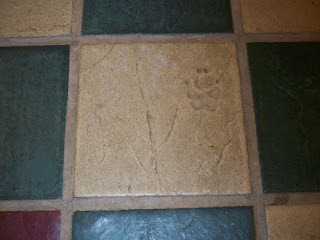 Up the eastern coastline a ways, at Disney’s Hilton Head Island Resort, that playful pup Shadow has left his paw prints not only in the walkways, but also on the tile floors of the guest rooms. This has been quite a walk! So, the next time you are on a 5, 8, 10, or 13 mile hike around Walt Disney World, be sure to take a moment to notice all of those who have walked in these places before you. And if you have a second moment to spare, use it to think about what kind of footprint you are leaving on Walt Disney World.